Pop. 11,856. In Dist. Mun. of Muskoka, on the Muskoka R., Hwy 11 & C. Rd. 117, 55 km. N of OrilIia. Pop. 150. In Draper T., Muskoka Dist. on C. Rd. 20, 22 km. NE of Gravenhurst. Neither the history of the community nor the origin of its name have been recorded. Pop. 60. In the Town of Bracebridge, Dist. Mun. 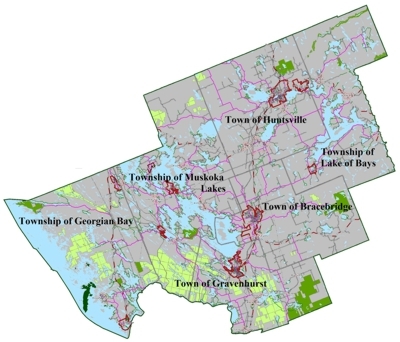 of Muskoka on Black R., 2 km S of Hwy 118, 30 km SE of Bracebridge. Pop. 112. In Lake of Bays T., Dist. Mun. of Muskoka at the N end of Lake of Bays and Hwy 60,2 km. NW of its junction with Hwy 35, 24 km. E of Huntsville.